Courtesy of Maritime New Zealand and the New Zealand Navy we travelled out to get some close-up pictures of the Rena. 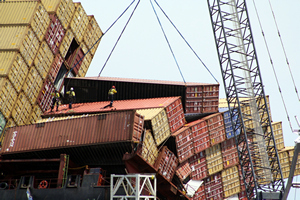 All the oil is now off the container vessel and salvage crews are working in very dangerous conditions to unload the more than 1300 containers left on board. We got out to the HMNZS Pukaki via the ship's zodiacs and it was a huge buzz to go about 35 knots over some pretty choppy seas. Once I work out how to put video on the site you can see some footage. In the meantime here are two new pages of photos I took from the Pukaki.